On 28 February, delegates descended on Technology Taskforce member PwC’s London office for the latest edition of our annual Technology Showcase, entitled “Disability, identity and technology: A journey through time”. Our very own Lucy Ruck led the day and introduced Paul Smyth of Barclays who took to the stage. 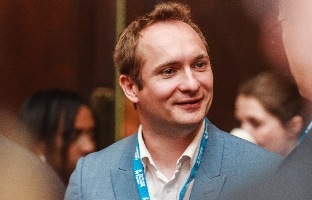 While many know Paul and the work he leads on at Barclays as their Head of Digital Access, few know about his personal journey, and how he has been “disabled by technology [and] enabled by technology”. Going from using outdated and cumbersome tech like desk-sized magnifiers and tape recorders(! ), Paul worked his way through a business degree and joined Barclays and has recently been named as one of the Government’s newest disability champions. Embracing his difference and disability has shaped his skillset and work ethic, where increasingly inaccessible technology forced him to “be the change he want[ed] to see in the world” and make things better for the next person like him. Elisabeth Ward of Scope then took the opportunity to tell us her story as a congenital amputee, defining herself through other’s perception of “normal”, when technical support only became available when she got to university and her impairment was finally recognised. As a child, Elisabeth carried around a booklet explaining why she was different, but she was also determined not to be left behind – and at secondary school the level of understanding was not high: “For example, in PE I struggled to control a hockey stick, and the other students treated me as though this was my fault. I would regularly strain my hand and wrist and the teacher just expected me to get on with it. There was no support to help me find solutions. I never felt like it was okay to say, actually, this isn’t working, I am not like everyone else, and I need it to change.” Overcoming the need to fit into what people expected of her at university and taking advantage of available support let her confidence flourish, which continued as she entered the workplace. Our third and final speaker was James Hallam, Controls Assurance at PwC, who made quite the entrance on his electric-assisted handcycle and told those in attendance about his Functional Electrical Stimulation (FES) handcycle, that has given James the power to use his legs again. Texthelp – helping everyone read, write and communicate with clarity. PWC Disability, Ability and Wellbeing Network. Posturite – ergonomic suppliers and service providers. MyClearText – on-site and remote speech-to-text reporting. Microsoft – empower every organisation to achieve more. Microlink – leaders in the field of assistive technology. Iansyst – assistive technology specialists. Bennett workplace – workplace & ergonomic solutions. Reasonable adjustments. Workplace Adjustments. Workplace support. Supporting you at work. Working in a different way. Being you. All are terms commonly used by organisations to describe how they remove barriers for employees at work. The language is important. The process behind the language is even more important. But getting experience of both right is crucial. It’s crucial for a number of reasons. At legal compliance level, employers have a duty to make reasonable adjustments where they know or could reasonably be expected to know that an employee has a disability or long-term condition. At good practice level, employers want to ensure all employees can work in a different way whether or not the employee says they have a disability or condition. At leading practice level, workplace campaigns and communications focus on how enabling employees to work in different ways is integral to workplace diversity and allowing people to simply ‘be themselves’. Here at Business Disability Forum, our advisers advise people managers and departmental leaders every day on adjustments policies and related employee caseloads. Many of our consultants are commissioned to work with businesses on improving their adjustments processes; and almost all of our policy work comes back to how Government, employers, and public life in general removes barriers for individuals. Get a service provider’s or employer’s workplace adjustments processes robustly designed and defined in a way that suits who the business are, how they work, and what they need, and that organisation is well on its way to delivering an inclusive pan-diversity employee experience that meets the needs of every single employee, whatever they are going through in their lives, and at whatever stage in their career. Yet, anyone keeping an eye on HR press or employment case law can see the adjustments processes employers have and continue to invest in are continuing to fail them and cost them greatly – both financially and reputationally. And so we want to find out what works, what doesn’t, what managers love, and what employees loathe. This is why we have released The Great Big Workplace Adjustments Survey which will grasp a picture of how both employees and managers across the UK feel about adjustments, how they are discussed in the workplace, how effective they are, and how far everyone who needs adjustments actually have them in place. Whether you are an employee, a manager, or someone else managing people and processes in your organisation, we are asking you to share your experiences of requesting and getting adjustments, or arranging and providing them for the people you manage. Please share it with your colleagues, managers, and employee networks. The survey closes on Monday 8 April 2019 at 8am. Please do get in touch if you would like to complete the survey in a different way (email: policy@businessdisabilityforum.org.uk). We’re looking forward to hearing what adjustments in an ever changing workforce are helping and hindering you, your managers, and your leaders to do and to be. The most successful businesses are known not just for their products or services or their competitiveness on price but for their customer service – and this means excellent customer service for every customer. But disabled consumers far too often still experience poor customer service. This usually isn’t because businesses don’t want disabled customers or even that customer facing staff don’t want to serve disabled customers, but is often because of fear; fear of saying or doing the wrong thing and giving offence which means that customer facing staff too often say or do nothing. The good news is that businesses who instill the confidence in their people to be “disability smart” and to ask how to best serve all their customers stand to reap considerable business benefits. Back in 2014, the Extra Costs Commission 2014 asked 2,500 disabled people whether they had left a shop or business because of poor disability awareness or understanding and 75% said that they had. This figure rises to around 80% for people with a memory impairment, autism or a learning disability. Within that 75% headline figure, seven out of ten (70%) had left a high street shop, half (50%) had left a restaurant, pub or club, and a quarter (27%) had left a supermarket. As well as being the wrong thing ethically and morally, it also makes no sense for businesses, financially. The spending power of disabled people and their friends and families – also known as the Purple Pound – is huge and currently estimated at £249bn per year in the UK alone. And from that same survey, the Extra Costs Commission estimated that the 8.4 million people in the UK who “walk away” were losing British Business around £1.8 billion per month. It’s not just about disabled people either; Millennials – and all of us – are increasingly making ethical and values-based choices on where we spend our time and money. So, I believe that getting it right and providing brilliant service for disabled customers can actually become a USP. The encouraging news is that businesses are finally waking up to this. The #Valuable campaign and the launch of the #Valuable500 at the World Economic Forum in January this year is all about the power of disability at brand level and the importance of including disabled people in products and services, right from the design stage. #Valuable500 aims to get disability on the agenda at board level in 500 – or more! – global companies and Virgin Media, Unilever, Microsoft and Barclays have already signed up. So how can you follow in their footsteps? Just last week, with the support of our Member Merlin Entertainments plc, we were delighted to launch our new ‘Welcoming Disabled Customers’ guide at Legoland Windsor, to help every business provide brilliant service to disabled customers. Designed as a simple reference tool, it aims to give confidence to customer-facing staff with really practical and simple hints and tips. It’s split into sections so that it’s easily digestible and can be used as a quick reference guide when needed. It starts with practical tips on how to support customers with different types of impairments, for example, how best to guide a customer with a visual impairment up or down stairs, plus helpful information on etiquette, for example, that someone’s wheelchair is part of their personal space. As anyone who has heard me speak knows (! ), one of the stats I like to use is that over 90% of disabilities are not immediately visible. So, it’s likely that for a large proportion of the time, customer facing staff may not know that a customer is disabled. So, the second part of the guide gives general advice and things to think about and to be aware of, like being clear when communicating, not using confusing language or simply taking time to ask what someone needs: “how can I help you?” really can go a long way! In this way, we hope that the guide will have the added benefit of making customer facing colleagues better at serving every customer because if you can get it right for disabled customers you get it right for everyone. It was great to see this ethos put into practice at our Legoland launch where the commitment to getting it right for disabled customers was obvious in every staff member. We heard some really moving stories from parents whose disabled child had been able to be “just another child” in their experience of Legoland and from the Legoland team whose passion for opening up as many attractions to as many people as possible was so apparent. We had the privilege of seeing not only the different options for accessible bedrooms in the hotel – we visited the “adventure” themed floor and it was great to see the different options available – as well as surely the funkiest Changing Places toilet ever and a very peaceful and beautiful sensory centre to enable everyone to enjoy the delights of Denmark’s greatest export (it’s something to build on). The fun setting (yes, we all had our photo taken with Lego sculptures and more!) didn’t detract from the fact that Merlin Entertainments plc are very keen to keep on improving in taking customer service for people with all kinds of conditions and disabilities seriously. With World Consumer Rights Day on Friday (15 March) and Disability Access Day on Saturday (16 March), the spotlight is firmly on customer service delivery, this week. But, let’s ensure that it doesn’t stop there. Meeting the needs of all customers is something which businesses should be doing every day of the year. If you would like to know more, then why not get in touch to find out how we can help? Like in the famous song, last week saw me strolling ‘sous le ciel de Paris’ (under Paris’ sky) to speak at a European conference on disability at work. This event, organised and hosted by the French Ministry of Justice (Ministère de la Justice), was an opportunity for experts from Canada, Germany, Sweden, Belgium and the UK to exchange with guests and staff from the French ministry of Justice on good practices in Europe and beyond. The French Justice Minister, Nicole Belloubet, opened the conference by reminding the audience that disability is a priority for the [French] government”. She outlined that the French ministry of Justice continues its work to improve inclusion of disabled staff, taking concrete actions such as increasing links with universities to facilitate the transition from higher education to employment. She also mentioned workplace adjustment process, manager and staff training as well as digital accessibility as areas that are being looked at for improvement. Over the course of two days, we heard about new and innovative steps taken in France around inclusion of disabled people in the workplace. I will write a separate article focusing on the changes to French legislation and French initiatives in the upcoming weeks. Sir Philip Rutnam, UK Civil Service Disability Champion shared great insight on the work done in the UK, particularly around the Fast Stream program, a graduate leadership development programme and around and around the UK government Disability Confident scheme, which “supports employers to make the most of the talents disabled people can bring to your workplace”. Amongst all the good practices shared, we also heard about the quota system in Germany and how there, disabled staff in the public sector elect a representative who can (amongst many other things) attend disabled candidates’ interviews to ensure the process is fair. I very much liked this democratic process! Canada being a federal country, this Act would only apply to organisations under federal responsibility. thinking about disability inclusion at the beginning of any discussion to avoid retrofitting. access to employment – including transition from education. In her closing remarks, Yazmine Laroche reminded attendees that although countries will adopt different approaches to disability inclusion, in every part of society including employment, reflecting our own ways and our culture, people with disabilities need to be included every step of the way. And that for me is the most important message that was shared with all attendees during these two days. Disability is not just a topic that should be discussed on occasion then forgotten for another year. It has to be included in every aspect of a business if we truly want to build an inclusive workplace and society. Retail banks have been providing enormous convenience to customers by developing their mobile personal banking functionality which is increasingly available in our pockets. As uptake by customers grows, a recent event at the Financial Conduct Authority (FCA) on 15 January 2019 considered who may be being left behind by this wave of new digital applications. Are these apps providing fair and equitable access and experience to all users, including those with sensory, physical or cognitive differences and impairments? In front of a packed room of financial service providers, digital product designers and regulators, Business Disability Forum brought together a great range of speakers providing fresh new insights into retail banking digital inclusion. The morning saw Open Inclusion present some of the key findings of its Mobile Banking Inclusion Report conducted last year. The report assessed and compared the inclusiveness of 10 UK banks’ iOS and Android apps. The session was kicked off with Shelley Cross from the FCA who outlined the importance that the regulator places on inclusion of all customers, especially those with vulnerabilities to receiving poorer services or exclusion, including those with lived experience of disability. Steve Tyler from Leonard Cheshire provided an enlightening talk on the power of technology and inclusive design in retail banking in the past, present and future. He motivated organisations to look to inclusive design to better understand and leverage emerging technologies. Not only will the 20% of customers with permanent specific access needs benefit, but in consideration of more extreme customer needs, organisations will likely generate insights that make for far more innovative, cost effective and durable products benefiting 100% of customers. Business Disability Forum’s Diane Lightfoot outlined some paths that banks could take to practically improve the customer experience of their digital products and benefit from the value of the £265 billion purple pound market segment. This included gathering regular insight from their customers who have disabilities and embedding the skills, capabilities and internal governance needed to ensure that every product iteration maintains or extends inclusive design, accessibility and usability by the broadest audience. Christine Hemphill of Open Inclusion introduced research that they conducted in 2018. None of them were fully inclusive to users with common access needs. The research found significant differences in inclusion across the apps of the 10 different brands tested. Sometimes there were also significant differences between the iOS and Android version of the same brand’s apps. The leading brands, led by Lloyds Bank, got results in the high 80s. A score of 100 would mean that core online banking journeys were all inclusive to most user groups. The lowest came in at a very poor 50 showing half of the functionality tested was not accessible to one of more significant user group. The average of all apps was 77. This research clearly shows that there is still a very long way to go to ensure that the needs of users with physical, sensory or cognitive impairments are supported by current retail banking mobile offerings. A survey with consumers with access needs was also conducted as part of Open Inclusion’s research. It identified what disabled and older customers appreciate and what they are currently unsatisfied with in relation to mobile banking. In it, 44% of customers with access needs covering all the major impairment categories and all major assistive and adaptive technology categories, noted that they would like their mobile banking app to be more accessible to them. More than 50% of respondents also wanted their provider to make it easier to do simple updates such as to personal information on the app and to find help / contact information when required. Business Disability Forum is proud to note that Open Inclusion is an expert partner of Business Disability Forum for market and user research and insight. This means that members can be confident that should they wish to engage them for inclusive research, customer insight, design and innovation services that they will get excellent quality work at the best prices on offer. Open provide a 15% discount on all inclusion services to all Business Disability Forum partners and members. Our annual technology showcase for 2019 entitled ‘Disability, identity and technology’ is in a few weeks and we will be looking at the concepts of ‘identity’ and ‘going places’ through the lens of technology. Take part in discussions about where technology has really made an impact and where it still has some way to go. Join in our talks about career progression and travel for people with disabilities. We are delighted to announce that our first speaker will be Paul Smyth, Head of Digital Accessibility at Barclays (pictured right) who will provide a personal perspective of working with a disability. Paul will share his own journey of disability and getting into his career at Barclays as a visually impaired accessibility leader and disability champion. Be prepared for stories of ‘turning heads’ and taking the long way around in getting a job, forging a career and in his own words “leveraging ‘whizzy’ technology and applying a resilient mindset”. We are also delighted to welcome James Hallam, Senior Manager in the London Top Tier Controls team at PwC. James will be sharing his personal story of how he uses tools and technology to enable him to get to work and do his job. He also talks about how this changes over time, often leading to interesting challenges and opportunities, sometimes via unusual routes!